Without a doubt, this aggressive action would anger our sleeping country and insight Congress to declare war. But how to accomplish this task without the U.S. firing first? President Franklin Delanor Roosevelt & Prime Minister Winston Churchill at the Argentina Conference, 1941. Steps had already been taken toward U.S. involvement as America found itself surrounded by the spreading threat of war. Roosevelt signed the Lend-Lease Act with Britain, China, the Soviet Union and other Allied countries on March 11, 1941, therefore, in essence, the United States had entered the war de facto against Germany. In August of 1941, at the secret Argentina Conference, at the U.S. 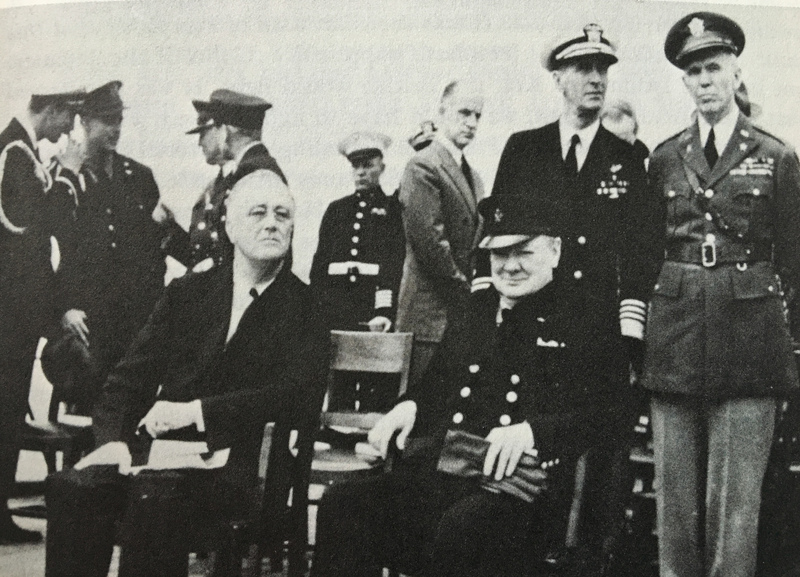 Naval Station off Newfoundland, Roosevelt assured Prime Minister Winston Churchill of America’s support if Japan attacked their holdings in the Far East. November 27th brought the “war warning,” forwarded to Admiral Kimmel and General Walter Short at Pearl Harbor on the peaceful Hawaiian Island of Oahu. Yet, this “vague” communique was misinterpreted, leaving little preparation for the ultimate assault by the Land of the Rising Sun on December 7, 1941. “Higashi no kaze ame,” crackled across the airways at Station M, the Navy’s East Coast shortwave monitoring station in Maryland, the morning of December 4th. Translated into “East Wind, Rain,” this sobering signal sent out by the Japanese indicated communication with American had ‘broken down’. Therefore, Emperor Hirohito, at the advice of his Prime Minister Tojo, intended to declare war against the United States. What to use as bait to provoke the first shot? Secretly, FDR agreed to a plan. The “three small ships” directive. A young Naval Officer, Lieutenant Kemp Tolley, was summoned from the Yangtze Patrol to Manila in early December, and assigned the USS Lanikai, a ship no one had ever heard of before. That is unless one remembered the schooner used in John Ford’s 1937 Hollywood extravaganza Hurricane, starring the sultry Dorothy Lamour. This assignment mirrored the other private yacht turned man-of-war, the USS Isabel. She and her crew had been sent a few days earlier, according to the president’s orders, to the “COAST BETWEEN CAMRANH BAY AND CAPE ST. JACQUES”. However, being shadowed by a Japanese scout plane and recognized as a U.S. warship, the enemy did not fire at her. The Imperial Japanese Navy could not afford to interfere with their months of strategy and preparation for the attack on Pearl Harbor and the Philippines. The Isabel was called back to Manila, the capitol of the Philippines, just as the Japanese bombers arrived to deliver death and lay waste to that county. Interestingly, this American stronghold would be abandoned by General MacArthur and declared an “Open City.” War shows no mercy. 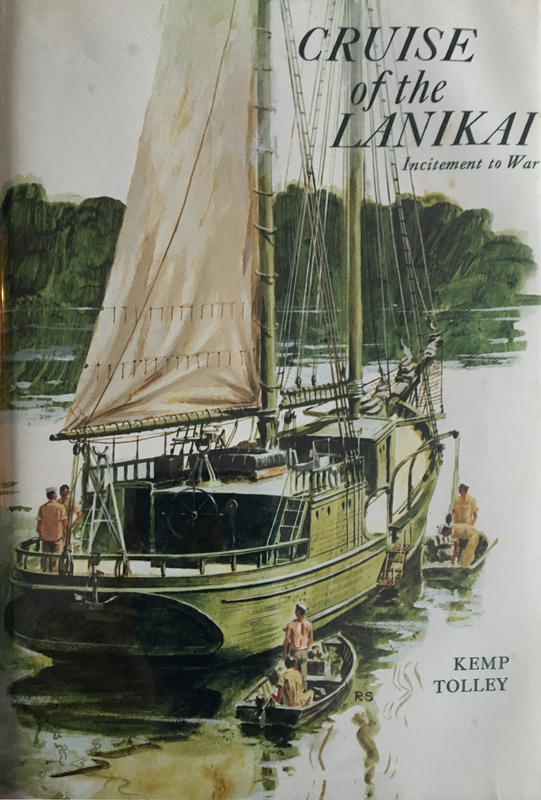 Luckily, the third schooner selected, Molly Moore, half Lanakai’s size, did not have to be used to lure anyone into battle, as the war had already erupted. Bravery comes in all shapes and sizes. To sail forth in a small yacht assigned the secret mission to be the bait to lure Japan to fire the first shot at you to start the war, was a tall order. Some have called it a suicide mission, a one-way ticket, a cause belli, bait. Any name you give the scheme of the “three small ships” proves only one thing. When our soldiers, sailors, or airmen enlist, they are committing to more than just a chance to serve their country. They are offering their very lives. And declared war on the United States, they drew us into WWII, the deadliest military conflict in history. For six years destruction, disease and starvation swept across all shores–all countries, causing an estimated 80 million deaths. On December 7th take a moment to remember and thank all the brave men and women who served in World War II, in the Pacific and European Theaters and at home. And give a nod of appreciation to those brave men and women who continue in their footsteps. Above all, hold to the truth that, at all costs, there should never be another world war. 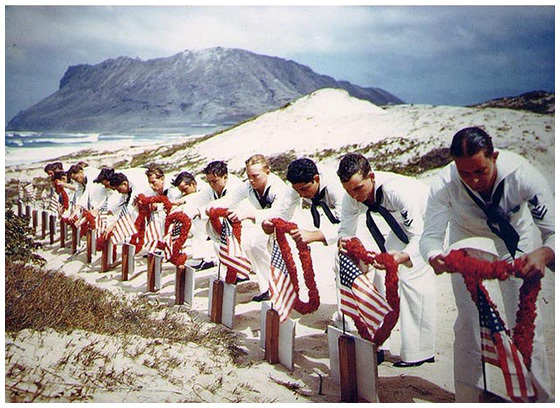 Sailors honoring those who died in the attack on Koneohe Naval Air Station – December 7, 1941.